EDINBURG — As Texas A&M-Corpus Christi was getting ready to inbound the ball down 2 points with 23.9 seconds to play, UTRGV guard Javon Levi slapped the court with both hands. Usually, Levi said the call to smack the hardwood comes from assistant coach Kenya Crandell. Whenever UTRGV needs a big defensive stop, Crandell will shout, “Get a smack!” The call reminds UTRGV’s defenders about the importance of staying low, which was Levi’s major focus as he switched assignments with Nick Dixon to guard AMCC’s Joseph Kilgore on the game-deciding possession. Levi had only been matched up with Kilgore three or four times to that point in the game, he said, but he knew what to expect. Kilgore had already scored 25 points on 11-of-16 shooting — all from inside the arc. Levi is listed as the shortest player on UTRGV’s roster at 5-foot-10, while Kilgore is 6-5. So, Levi was anticipating that Kilgore would look to take a midrange shot above Levi’s reach. University of Texas Rio Grande Valley's Nick Dixon (4) drives to the basket against Texas A&M-Corpus Christi's Colin Hale (20) in a nonconference game at UTRGV on Wednesday, Dec 6, 2017, in Edinburg. 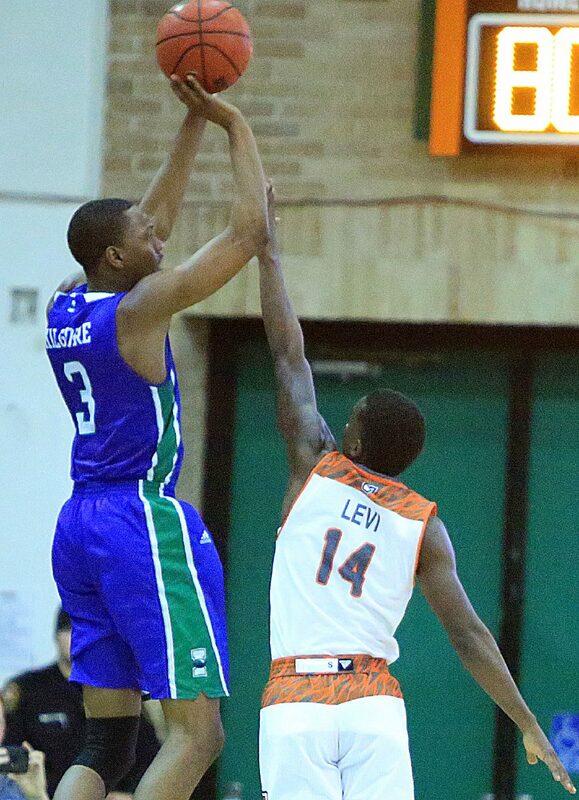 University of Texas Rio Grande Valley's Javon Levi (14) attempts to block a shot from Texas A&M-Corpus Christi's Joseph Kilgore (3) in the final seconds of the game in a nonconference game at UTRGV on Wednesday, Dec 6, 2017, in Edinburg. Levi did everything he could to deny Kilgore the ball, keeping it out of his hands for most of the possession. By the time Kilgore received a pass, he could make just a few contested dribbles before being forced into an air-ball 3-pointer as UTRGV held on for the 82-78 win on Wednesday in the UTRGV Fieldhouse. Levi’s stop was a bright spot on an otherwise tough defensive day for UTRGV, as AMCC shot 53.4 percent from the field. But Hill credited UTRGV’s pressure for wearing AMCC (2-6) down, as the Islanders connected on just 1 of 6 shots during the final five minutes. On the other end, UTRGV (5-6) had its best shooting night of the season, connecting on 48.4 percent from the floor. Nick Dixon scored 24 points on 8-of-12 shooting, while Lesley Varner Jr. netted a season-high 14 on 6-of-9 shooting. Moe McDonald chipped in 11, and Mike Hoffman also cracked double figures with 10. 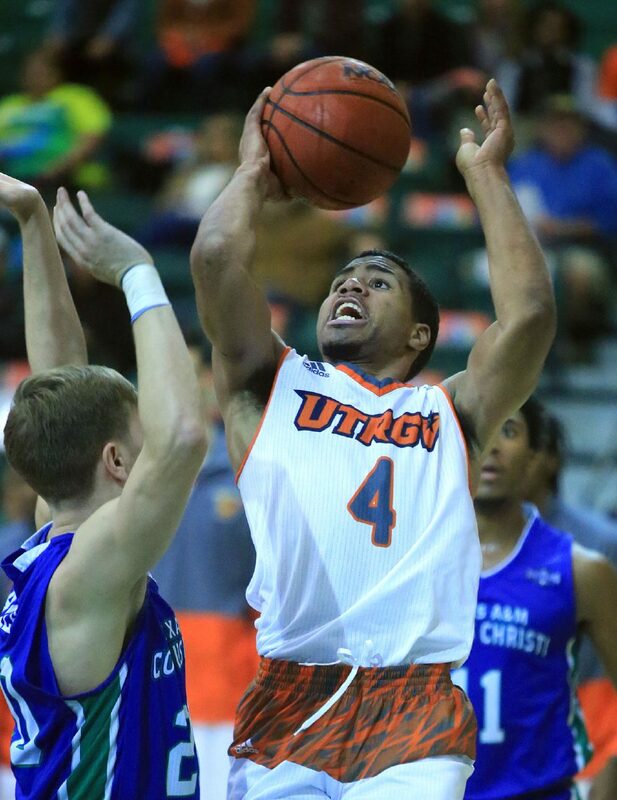 As a team, UTRGV had 18 assists against 11 turnovers in only its fourth home game of the season. UTRGV’s offensive improvement came despite the team being without its second- and third-leading scorers in terms of points per game. Xavier McDaniel Jr. (11.5 points per game) and Jordan Jackson (8.0) both missed the game due to injury, as did forward Adonis Rwabigwi. Hill said all three players are day to day going forward.